Sleeker, faster, and more versatile than ever. Toshiba’s high-end A3 colour line-up is as impressive on the outside as it is on the inside. 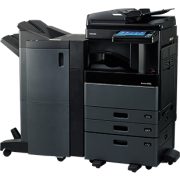 Its ultra-modern look houses the latest innovative technology, delivering brilliant quality documents at speeds of up to 75 pages per minute (ppm) in colour and 85 ppm in monochrome. Fully customisable A3 multifunction colour systems for impeccable document output at speeds of up to 75 ppm in colour and 85 ppm in monochrome. A standard Dual Scan Document Feeder for fast and reliable document processing at up to 240 ipm. Advanced media handling combined with superb image quality allows for easy in-house creation of a large range of professional looking documents.